Pooris are one of my favourite weekend breakfast dishes. 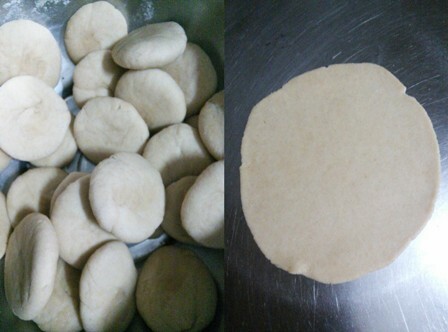 During my childhood days I helped my mom to prepare chapathi and poori during weekends. 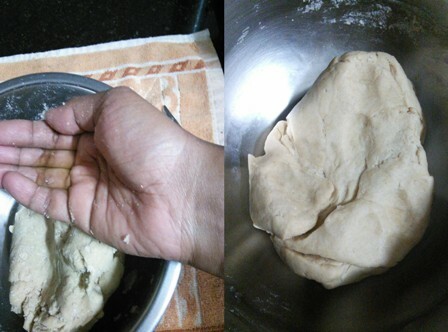 So I started learning the kneading work from my school days onwards. After so many practices I found the trick for perfect pooris. As you all familiar with pooris we will see the tips for perfect pooris. 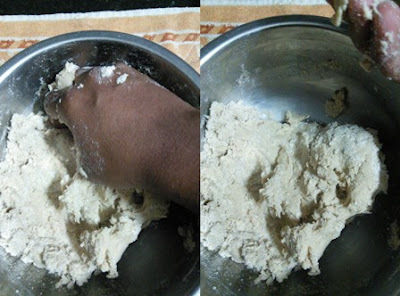 We have to knead the dough a little bit tighter than the chapathi dough. For softness I add ghee in the flour and then knead the dough by adding water little by little so that you can get softer pooris. For poori dough, I prefer whole wheat flour. There is no need for any soaked rava or sugar or any baking powder. For rolling the pooris apply a tsp of oil on the rolling board and on the rolling pin. One more important tip. Do not keep the pooris long after you roll them. Fry them as soon as you prepare them. For frying the pooris heat the oil well on medium flame and then fry the pooris. If the poori is browning too fast, reduce the heat a bit. The perfect side dish for poori is the evergreen potato masala. Nothing can beat this combination for pooris. You can also serve coconut chutney along with the potato masala. Check out my recipe for potato masala also. Take a wide bowl. 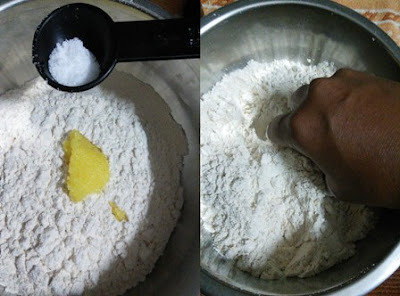 Combine the wheat flour, ghee and salt. Add water little by little and knead the dough evenly. Scrape the sides of the bowl and then add little water and mix them gently. Continue to knead them well with your hands. After the dough comes together like a ball apply a tsp of oil in your palm and continue to mix the dough with little pressure until the dough is smooth. Apply a tsp of oil on the rolling board and the rolling pin. Using your palms, roll each balls and flatten with your palm like small circles. Now gently roll each circles with the rolling pin in circular motion. Heat the oil in a deep frying pan on medium heat. When it's hot enough for frying gently add the poori. When it puffs up, flip to the other side and fry for a second. Remove from the pan and place them in a paper towel. Repeat the process for the entire pooris. Take a wide bowl. 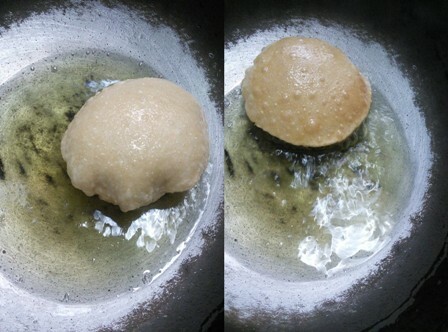 Combine the wheat flour, ghee and salt. Mix them well with your fingers until all the ingredients well combined. Do not add any water now. Continue to knead them well with your hands. After the dough comes together like a ball apply a tsp of oil in your palm and continue to mix the dough with little pressure until the dough is smooth. Keep it covered for 15 minutes. Divide the dough into 20 to 24 equal balls. Apply a tsp of oil on the rolling board and the rolling pin. Using your palms, roll each balls and flatten with your palm like small circles. Now gently roll each circles with the rolling pin in circular motion. (Apply a tbsp of oil in the rolling board). Heat the oil in a deep frying pan on medium heat. When it's hot enough for frying gently add the poori. Press them gently with the ladle. When it puffs up, flip to the other side and fry for a second. Remove from the pan and place them in a paper towel. 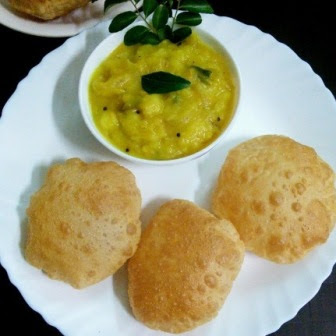 Enjoy this hot and soft pooris for your weekend breakfast. 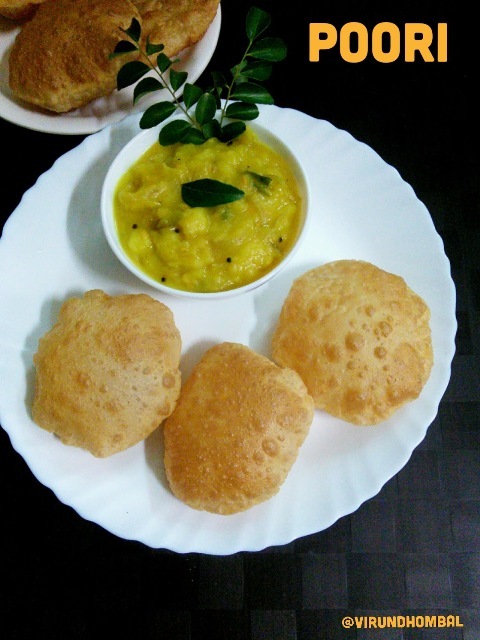 If you try this recipe for Poori send us your comments below and share the recipe for your friends and family. Potato masala - the ultimate side dish for poori. A simple side dish for poori with mild flavours and fantastic taste. 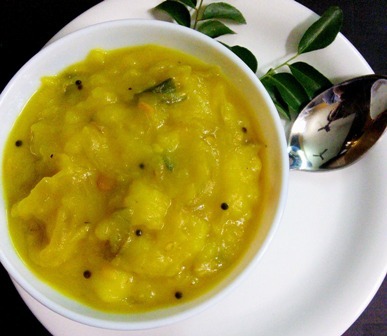 In TamilNadu, it is popularly called as poorikizhangu.READ MORE..